Ello there, I am odd and weird. I think that's all you need to know. mumbled "This needs my name written all over it "
mumbled "New story coming soon "
New story coming soon....when you read it, take in consideration of the Author. mumbled "Today is the best day ever"
After nearly two years of not seeing one of my best friends in the whole word, I finally got to see here. After all this time.... I wanted to cry but I was too excited to. It was so unexpected and I'd never thought I would get to see her this year. My life is complete now and I'm more happy than I have ever been in my life. I am shaking and i was finally able to hug her and tell her how much I've missed her. I can't believe this is happening...is this even real?? mumbled "Real questions are being asked here"
It probably is because he didn't die. 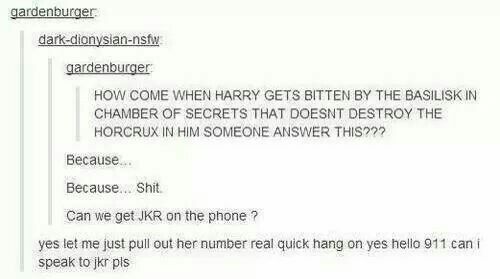 The Horcrux in him probably got "scratched" or something, but didn't get completely destroyed because the attack made by the Basilisk didn't kill him.